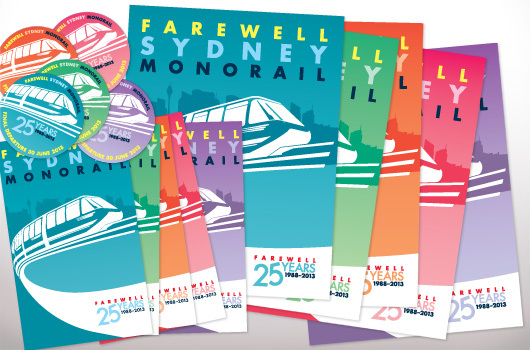 Tag Archive | Why was Sydney monorail removed? We don’t often associate the 1980s with the term ‘heritage’ but with the renewal of interest in all things Retro perhaps the time is approaching when we may start to look at built forms of this vintage in a different light. Frankly, heritage is heritage, regardless of the era in which it was conceived, and should be regarded as such. On Sunday 30 June one outstanding example of 1980s heritage took its final lap of honour around Sydney, the city it graciously serviced for the last quarter of a century. Known simply as the Monorail, this vision of modernist transport could be seen daily, snaking its way along a suspended steel track between the growing skyscrapers of downtown Pitt Street, brushing the fringes of Chinatown and rumbling sexily over the elegant Pyrmont Bridge, its passengers gawking at the wonderful vistas over a resplendent Darling Harbour, the ‘darling’ in fact, of that magnificent bi-centennial period of Australia’s history. With Space shuttle-like lines, the Monorail certainly made an impact in those heady days of Hypercolour T-shirts and C’mon C’mon Do the Locomotion with me. Unveiled in 1988 to service the needs of commuters and tourists alike, its introduction coincided with the high profile redevelopment of Darling Harbour, from gritty working class port to entertainment, shopping and conference mecca, a lasting symbol of our coming of age boom-time and in fact the crowning achievement of Barrie Unsworth’s tenure as premier (no, not the ruthless dictator Barry we have now). Much of that popular refurbishment of Darling Harbour is still there to be seen in its glassed archway and steel framed glory. The award-winning Exhibition Centre and curvaceous Conference Centre, the numerous fountain and water games, the Chinese Gardens, and of course there have been welcome additions over the years, the Sydney 2000 sculpture and Spiral Fountain for example. Some have come and gone as well, like the short-lived but ambitious Sega World. It all combines to create a kind of synergy, a tangible ode perhaps, to the feel of the day, to the late 1980s, a time of great prosperity and almost unlimited potential for Australia. Think INXS, annoying matchmaking robots named Dexter, Tall Ship re-enactments and of course all that bi-centennial patriotism. It was a magical time. Returning to Darling Harbour in the present, many of us still feel a glint of nostalgia for that period, a small magnetic force that radiates from stepping through the scene today. We look around, take in the sights of the Harbourside halls, the overhead freeways, the passing Monorail, it brings us back to a more innocent time perhaps, a time when we were almost considered by the rest of the world as a fledgling nation. But all those tangible feelings that surround the unmistakable shapes of Darling Harbour may soon be lost. Strangely, even this group of richly identifiable structures that were built cohesively only 25 years ago can’t be seen as permanent by the current regime of that other Premier Barry Mk 2, the faulty O’Farrell version. Plans have been unveiled to transform Darling Harbour once again, into something much bigger and more profitable. Massive highrise at Haymarket including towers of up to 40 levels , a new convention centre and the demolition of the Sydney Entertainment Centre, the current Convention Centre and visually stunning Sydney Exhibition Centre are being pushed through by this developer-drunken state government and their ‘business partners’ Lend Lease. This follows a redevelopment at the Tumbalong Park end where until recently a pretty pond sat where tourists could paddle boats around and look at the skyline beyond. While some public space was retained, the buildings were made bigger, and the pond ofcourse filled over. So the Monorail, that wonder of the modern age, that glint in our eyes back in 1988 when we collectively thought “well, we have a monorail now, we’ve arrived as a city”, may not be the only casualty of the new school of knock-em-down planning in NSW. Much more of Darling Harbour’s golden age may go with it. More on this next time but for now here is an interesting story on it in the SMH. Click here. Whether you lament the passing of the Monorail or not, it is worth remembering as an icon of that time, and Darling Harbour as a bubble formed within that exciting progressive period, under the richness of optimism that somehow manifested itself in the era, something that has only shown rare glimpses at the surface ever since. And as a people mover, it still rates quite well, with around three million people using it per year, despite the high ticket prices. Sure it is not as effective as light rail, but it does have the added draw card of being a tourist attraction, as well as holding the stylistic x-factor. And it’s all still there, it’s not something we have to draw $250 million out of the public purse to build, this thing actually exists and could’ve remained part of our transport solution alongside light rail, alongside buses, well into the future. 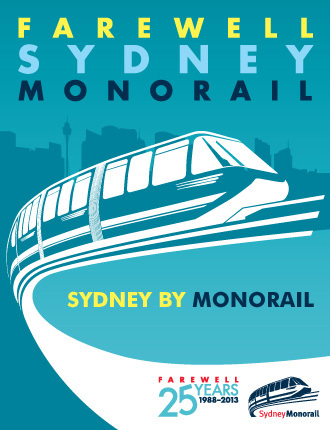 Transport Minister Gladys Berejiklian has unflatteringly used the terms “white elephant” and “almost a fad” to describe the Monorail in its final days but with 1,500 people entering a ballot to go for a ride on the last loop it obviously meant something to quite a few Sydneysiders. Two carriages and a small section of track are all that will be retained in the Powerhouse Museum, the rest will be scrapped. Personally I will miss it… I was only a child when the Monorail was built and I can remember people used to venture into the big city just to catch a glimpse of the new machine. It was almost like the first days of steam in the early 1800s… people huddling around the unknown beast with a mixture of incredible awe and uneasy trepidation, quite an experience for a young boy at the time. I think options could have been explored. With the timely introduction of the new Opal card there was an opportunity to link it in to the greater public system. Perhaps they should have re-labelled it the ‘Bi-centennial Monorail.’ A twilight moving restaurant or bar within its coaches, similar to the restaurant tram in Melbourne, may have given the Monorail a new lease of life. Sometimes a little creativity is all that is required for a fading business model to reignite. If it did have to go then an elevated running track or cycleway was worth investigating, to give something back to the people of Sydney, to recycle a perceived ‘outdated’ form of transport with a new, cleaner, greener one, as well as being totally practical and just plain worthwhile doing. The infrastructure is pretty much there in its entirety, only a new decking platform with transparent side walls was required, which could have easily bolted on. If nothing else I will miss the sneaky motorcycle parking beneath and between the pylons. Anything that discourages cars from entering the CBD is a good thing. And of course all those bars and restaurants that have enjoyed interesting close-up views from their windows and balconies, allowing patrons to gain new perspectives on what is essentially a marvel of engineering – their views will become slightly more ‘boring’ now that the Monorail is gone. I may be alone here but I think the city as a whole may become just a little more ‘boring’ with the loss of the Monorail. To me it’s part of our city, it’s still exciting as well as being part of our modern ‘heritage’ texture. But then again we, as a nation, are getting quite good at letting these things go so easily after the easy money has been made. And as if to prove that point, the government website monorail.com was closed the day after the last Monorail ride. 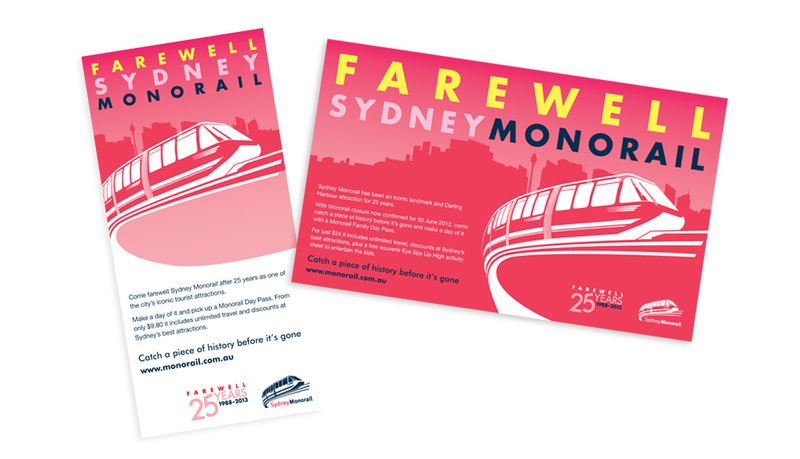 If you enter that into your browser you will get a business-like message stating ‘Sydney Monorail is now closed. Please wait to be redirected to the Transport Info Website.’ In other words, move along now, there’s no time for nostalgia here... The future became our history in the blink of an eye. Click on the images below to start gallery. Ticket images transmarketing. Next time, we look at Barry O’Farrell’s awful, awful plans for Darling Harbour. A nice montage of monorail scenes. An early image courtesy Monorails.org. yes we were driving cars like that Honda Civic when the Rail was launched. Passing the old Gowings Building. Image Phillip Quirk. Traversing historic Pyrmont Bridge. Image John Grainger. A brilliant photo by Gary Hayes. Another standout by Gary Hayes. Final resting place, at a scrap yard in St. Peters. Image Peter Suchecki.